Paintball is one of the Truckee Summer Activities to try! Paintball looks like super fun! I've never been myself, but my son and my brother have. I spent some time up at High Camp in Squaw Valley recently during the Wild Wild West Weekend, and was watching the paintball target practice going on which was fun. I've always had a fascination with "guns" and went with my son Ryan to a indoor shooting range this last year which was a blast, so I'm sure this is a sport that I would love! According to Wikipedia, Paintball is a sport in which players compete, in teams or individually, to eliminate opponents by hitting them with paintballs propelled from a device called a Paintball Marker, otherwise known as a "Paintball Gun". Paintball is a great team sport and helps people to learn to work strategically with a team and is an activity conducive to Corporate retreats. You have to work together to win and think strategically several moves ahead. A "Speedball" course - this is located below the lower tennis courts, which is below the Ice Skating Rink that is used for Roller Skating during the summertime. The course has inflatable paintball "bunkers". A "Woodsball" course - this paintball course uses the natural terrain along the Silverado ridge line adjacent to High Camp. A Woodsball course is a term used for any form of paintball played in wooded or natural surrounds, vs. an area or artificial field. Paintball Marker, otherwise known as a Paintball Gun: The guns have an attached loader or "hopper" to keep the gun fed with paint. As with any type of sport equipment, there are multiple options and equipment varies depending on the type of game that is played. Mask or Goggles - Safety devices that players are required to wear at all times on the field to protect them from paintballs. The masks completely cover the eyes, mouth, ears, and nostrils of the wearer, and they can include throat guards. 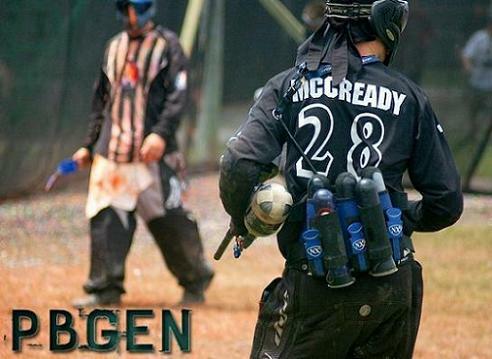 My son Ryan's friend, Dan McCready playing Paintball. 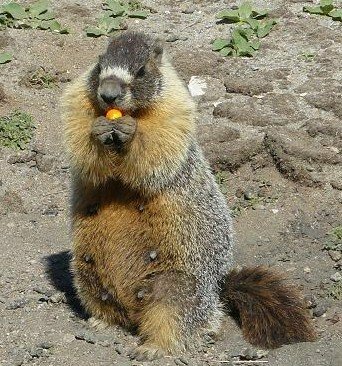 While up at High Camp, I discovered that there were a lot of Marmots running around the tennis court area right above the Paintball Speedball Course. The one pictured below, ran to the the Paintball course, grabbed a paintball, and came running back up to the Tennis Court and stopped about two feet from me, and proceeded to EAT IT!! Of course, I took pictures, and that inspired a "MARMOT" page on the Truckee Travel Guide Website! My first reaction was...."Oh No...this can't be good for them!!". Fortunately, in researching this Paintball page, I discovered that the Paintballs, are actually capsules that contain food coloring and gelatin and have a non-toxic, biodegradable, water soluble mineral-oil. Phew!!!! The Marmots probably feel like it is their "bright shiny lucky day" to quote Stuart from Mad T.V., when they are able to find one to eat!! ....And the Question of the Page is... "Does it Hurt to Get Hit with a Paintball? The quick answer would be "Yes"! Just how fast can Paintballs come shooting out? To quote Tom Harris of "How Stuff Works"...."In order to make the game safe, the power of paintball guns is strictly regulated. Guns in play are adjusted so that the top speed of the fired paintball is 300 feet (91 m) per second. A paintball moving at this speed is unlikely to cause serious injury if it hits your skin, though it will sting and may leave a bruise. Also, since wind resistance starts slowing the paintball down as soon as it leaves the gun, it has a reduced impact when fired from a greater distance. 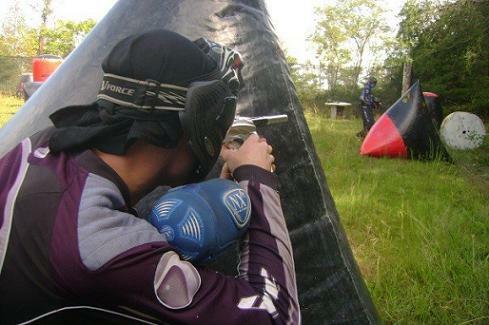 Speeding paintballs can cause serious injury to the eyes or ears, so paintball players always wear head protection." It is more startling that painful - quoted from Joe Pommier of Bear Creek Pursuit Paintball in Bear Creek, CA. "You get bruises, but it's worth it!" - quoted from Ken Price, the owner of Paintball Paradise in San Francisco. My son Ryan's friend, Dan McCready playing Paintball...getting ready for the shot! The Paintball must break and leave a mark the size of a US quarter or larger. 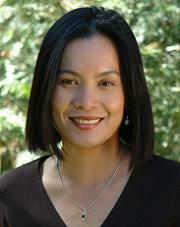 Eliminated players are expected to leave the field of play, either for a time or completely depending on the game rules that are being played. Scenario Paintball - including defending or attacking a particular point or area, or capturing objects of interest hidden in the playing area. Some games are more complex and involve reliving historical moments. Woodsball - teams competing in a wooded or natural environment. Rules for Paintball vary depending on whether it is an indoor or outdoor field, whether you are playing for fun or in regulated play and with organized competition, and can even vary among countries and regions. The course that you decide to go to, will have their own list of Rules that you must follow in order to play at their facility. In places where regulated play is an option, players are required to wear protective masks, and the game rules are strictly enforced. For indoor fields, the game field has artificial terrain that you can use for tactical cover. Outside fields use natural terrain for cover. Fortunately at High Camp, Squaw Valley, there are lots of trees!! Game time also can vary and depends upon the time frame allowed by the facility that you choose and how long you opt to pay for.